It is nice to have lights on your bike that are permanently attached and ready to go at the flick of a switch, just like the headlights on your car. 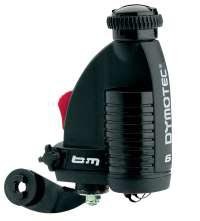 Welcome to the world of bicycle generators (sometimes referred to as “dynamos”). Baby boomers may remember a generator as a clunky, whining device rolling against the side of a tire. The light flickered and was dim at low speeds, the bulb blew out if you rode too fast, and it caused noticeable drag whenever you turned it on. Then one day it stopped working at all. But modern generators are mechanically and electrically superior to the generators of old. They produce the same amount of power, but electronic output regulation along with tremendous advances in LED technology and headlamp optics mean much better light at all speeds, even when stopped. Even competitive endurance cyclists use modern generators and LED headlamps, riding fast multi-hundred mile events all day and all night. Maintenance free and always ready. Want to extend your evening ride? Traveling and unable to recharge your lights? Or just don’t want to bother with battery charging, battery replacing, or remembering to take your headlight? No problem. Theft-resistant. Generators and their lights bolt onto the bike, but clamp-on battery lights can be unclamped by any passing pilferer. If necessary, theft-proof fasteners can add even more security. There's no need to remove your lights and take them with you when you park your bike. Environmentally friendly. No battery waste, no hazardous materials. More electrical reliability. Generator electrical connections are usually permanent. Battery lights tend to suffer more problems with bad connections, especially internal battery contacts or external cords that are frequently plugged and unplugged. More mechanical reliability. Many battery lights are comparatively flimsy, often held together by plastic snap tabs, and clamped to the handlebar so they are easily knocked out of alignment by a hand or knee. It’s not uncommon for parts to dislodge upon hitting a bump. Generator lights are typically more rugged. More system reliability. The most common failure mode for battery lights is lack of battery capacity - either disposables that have drained, or rechargeables that haven’t been recharged. Also, rechargeable batteries give less than rated capacity as the years pass, sometimes surprising owners on long rides. Generators just keep on working. More difficult to install. Bottle and roller generators (see below) must be properly aligned with the tire to minimize drag. A hub generator requires that someone build it into a wheel. Headlamps must be bolted in place. Wiring must be properly installed. Many units may present difficulty with carbon fiber forks. In general, some mechanical skill and a bit of electrical skill are needed, although once a system is properly installed, few problems are experienced. Lower maximum power. Typical generators are rated at three Watts, although six Watts output is possible with some. Battery lights can consume as much as 20 Watts. However, modern LEDs and careful optical design have made three Watts suitable for any reasonable road riding. Mountain bikers will probably always use battery lights. Noise. Bottle generators may produce an audible whine at their tire contact point. Other types are silent, or nearly so. Slipping. Bottom bracket generators can slip if mud coats the tire tread. Bottle generators can slip in heavy rain or snow, unless special drive wheels are used. Hub generators are immune to this problem. Difficult to move from bike to bike: You’ll generally need one generator set for every bike you plan to ride at night, or at least for every front wheel. Blowing bulbs, no light when stopped. These are problems from the (literally) dim past. Modern lamps feature better electrical regulation, their LEDs last nearly forever, and built-in capacitor power storage keeps the lights on when the bike is stopped. If you aren't ready to buy a new generator, you can still avoid these problems with a new lamp. 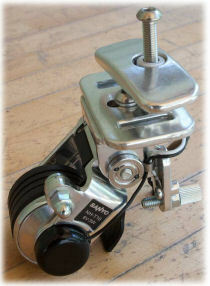 Many newer lamps will work fine even with the low power output of an old Sturmey-Archer Dynohub. Cost. A modern generator system costs typically twice as much as a battery system with comparable output. Generators are most likely to benefit cyclists who can't be sure how long they will be riding after dark, those touring by bicycle, or those traveling by other means with a bicycle along - for example, traveling by train, then using a bike within cities. Sport cyclists may do better with battery lights, although one survey of 750-mile Paris-Brest-Paris competitors found those using generator lights were much more satisfied than battery light users. Mountain bikers will almost always prefer battery lights. A bicycle generator has a stationary wire coil that connects to the headlight and, sometimes, the taillight. Permanent magnets are made to rotate either by use of a roller contacting the bike tire, or because the magnets are fastened to rotating parts of the bicycle’s hub. When a magnetic field moves in the presence of an electrical conductor (e.g., a coil of wire) voltage (the electrical equivalent of pressure in a pipe) is generated in the wire. If the wire is connected to a properly selected electrical load (such as a light bulb or LED) current (the equivalent of flow in a pipe) is generated and light is produced. The faster the rotation, the more power the generator puts out. In the past, this was a problem for ordinary bulbs, which would sometimes blow out at high speed. But improvements in electronic power regulation have solved the problem. There are three common designs for producing the magnetic rotation to generate electricity. Each design of generator has certain advantage and disadvantages. These were the most common type for many years. The body of the generator is shaped somewhat like a bottle, with the drive wheel forming the bottle cap. The drive wheel leans against the sidewall of the tire (sometimes upon a special “generator drive track”) and spins the generator’s main shaft. Inside the body, the shaft rotates the magnets. The image if of a modern Busch & Müller tire-driven generator. Advantages: This is the least expensive design. Used ones can be found for free. They are small and weigh little. They can be mounted to either the front or rear wheel. To turn the generator off, you swing it out of contact with the tire, so there is zero generator drag when it’s not in use. Disadvantages: They usually have more drag than other designs. They tend to slip in heavy rain or snow. There’s usually some noise. Tire sidewall wear can be a concern with lightweight tires. The generator and its mounting must be carefully aligned with the bike wheel to minimize drag and wear. If the wheel is badly out of true, the generator may slip at that point. Brackets usually clamp to the fork or frame, and may not be advisable with carbon fiber. The generator and mounting clamps are very visible, and some object to the appearance. These uncommon units typically mount between the cranks and rear wheel, under the bike. The roller contacts the center of the tread, not the sidewall of the tire. These are no longer made, but you may find one as new old stock or slightly used. Advantages: Small and almost hidden, these are nearly invisible on the bike. More protected position, which may be especially valuable for some folding bikes. Zero drag when off. Contact with the tire tread prevents tire wear problems. Larger rollers produce somewhat less drag than with bottle generators Quieter than bottle units. Disadvantages: Much more tendency to slip in mud or snow. If sticky road tar (etc.) accumulates on the roller, it may cause vibration. Roller and bearing wear are hastened by road dirt. Difficult to turn on or off without dismounting. Mounting may be difficult on frames with tight space near the bottom bracket. Not compatible with a bottom-bracket mounted kickstand. 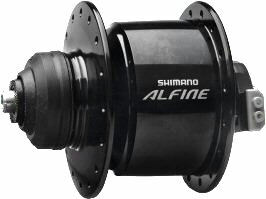 These replace the normal front (or rarely, rear) hub. They are installed by building or rebuilding the wheel, unless bought as part of the wheel. Most have no extraneous moving parts, although a very few have on-off clutches to further reduce drag. Hub units are usually judged to be the best bike generators, and are rapidly gaining market share, especially as original equipment on European utility bikes, since this avoids the cost of (re)building a wheel. The original hub generator was the Sturmey-Archer Dynohub, manufactured from 1936 through 1984. Sturmey-Archer (now of Taiwan) has introduced new Dynohub models as of 2010. Our article about Dynohubs also includes information useful with other hub generators. The fanciest an most expensive hub generators are made by Busch & Müller, in Germany. These have a special feature which protects them from condensation of moisture inside. Models are made for different dropout spacings and wheel sizes. Advantages: These are the most efficient and most reliable bike generators, with the least amount of drag when turned on. No possibility of slipping. Very inconspicuous on the bike, so theft resistant. The easiest generator to move from bike to bike: just trade wheels, assuming the wheel sizes are the same. Disadvantages: The most expensive generator type, especially for aftermarket sales. They require building a wheel, which most cyclists will trust only to a bike shop. There is some drag even when turned off, although it’s negligible with the best models. Unlike with other generators, small-wheel bicycles may need a different model hub unit, since wheel rotational speed is different. (Tire tread speed is not affected by wheel size, so this is not a worry for bottle or roller units.) Some hub units produce a very slight vibration in the handlebars at certain speeds. Some headlight flicker may be visible at super-slow (walking) speed -- but this is actually an advantage because more light is produced than if the power output were steady. As noted above, installation of any generator and its headlight requires more mechanical skill than installing a clamp-on battery light. A bit of electrical knowledge is handy as well. Here are some tips and considerations. Mounts must be very solid for bottle and roller units. Loctite or other thread-lockers are a good idea. Bottle units should mount in front of, not behind, the fork blade or chainstay for insurance against jamming in the spokes. Bottle units come in right- or left-side versions. Proper choice ensures the unit swings properly into contact with the tire and/or doesn't cause excess drag. Double-wire all generators. Electricity always requires a conductive path (a wire) to the light, and a return path to the generator to complete the circuit. Many old bottle generators used the metal of the bike frame as the return path, with a pointed screw digging through the paint to bite into the metal bike frame. This was a frequent source of trouble. It’s much better to run two wires, one being the “hot” and the other the “ground.” (Hub generators come with double wires.) two-conductor zip cord works fine for generator wires. A carbon-fiber fork or frame does not conduct electricity, and so double wiring is absolutely necessary. Don’t mix up the two wires! Some folks have double-wired as above, but connected the “hot” wire to ground. Everything will look fine, but you'll get no light! Pay careful attention to the two different colors of your wires, and to where each is connected. Control your wires. Straighten them before installing them - no kinks or bends - and run them in a neat line, perhaps along the back edge of the fork, or following the brake or shift cables. Use zip ties to keep them tight to the frame, or to tie them to the cable housings. Leave just enough slack at the proper place to let the forks pivot. 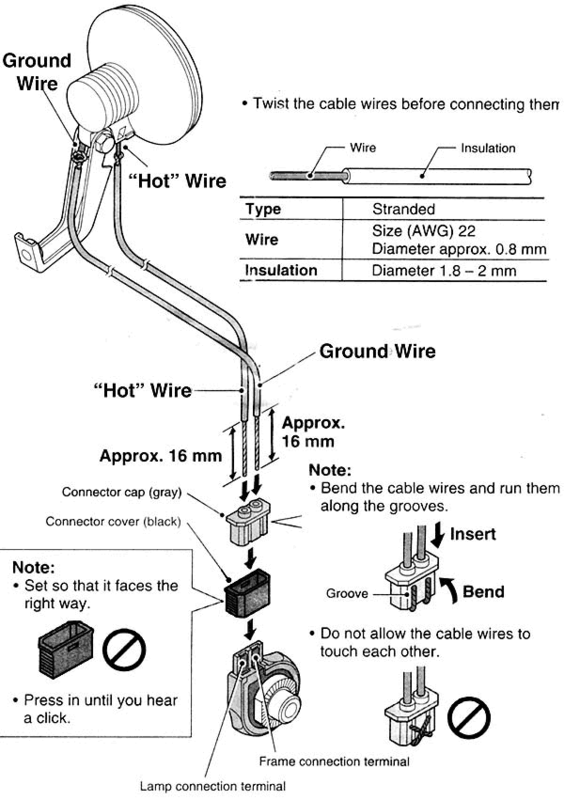 The illustration below shows wiring of a Shimano generator. Hub generators need a switch. Since the magnets are always rotating with the hub, it’s normal for hub generator headlights to have an on-off switch. If you wish to use a non-switched headlight, your choices are to either add a switch to the circuit or to always ride with the light on - a Daytime Running Light. Bottles and rollers don’t need a switch. Bottles and rollers need careful alignment. Roller generators must be accurately parallel to the bike wheel, but this is often guaranteed by the bike frame and generator mount. The axis of rotation of a bottle generator must intersect the axis of rotation of the bike wheel. This requires careful alignment. Also, the roller must not run on a portion of the tire sidewall that has lumps, such as molded-in letters. Some tires feature “generator [or dynamo] tracks” on their sidewalls, smooth tracks except for a fine file thread. A few bottle generators have rubber rollers that can run on a rim’s braking surface. These are very quiet and less prone to slip. Additional connections. A generator may also be used to charge a lamp for night-time use when bicycle camping, or a cell-hone or GPS unit -- more about this is in our article Riding with RidewthGPS. What about carbon fiber? The popularity of plastic bikes has especially complicated the fitting of bottle generators. Clamping to carbon fiber forks or seatstays is seldom recommended. Custom brackets may be needed, if indeed the project is possible. Hub generators avoid this problem; and as a general rule, if you can afford a carbon fiber frame, you can afford a hub generator! Think about your headlight position. Headlights on handlebars are quite popular, but there are better choices. Mounting a headlight at about 25" to 30" above the ground - at the fork crown or on a front rack - allows the beam to skim the road much like a car’s headlight beam. Potholes show up better as dark spots, rocks and bumps show up brightly, and there’s less glare in your eyes when it rains or snows. There’s also less wire to accidentally snag, less interference with handlebar bags or a rain cape, and more room on your handlebars for your cyclometer, GPS, compass and Mickey Mouse bell! Some headlights have better beam patterns than others, so also see our article on headlight choices. Bicycle lighting has come a long way as bulb design has improved. Into the 1970s, bike lights - whether generator or battery powered - used plain incandescent bulbs, which were never very bright and got dimmer over time. Those lights were marginal at best, perhaps really adequate only as “being seen” lights for use in well-lit city streets. Halogen bulbs came on the scene in the late 1970s. They were much brighter than competing incandescent bulbs and did not dim over time. Simultaneously, it became possible to buy bike headlamps with optics that directed the light properly onto the road, similar to motor vehicle headlights. Since light was not wasted into the trees overhead, one could spot potholes and road debris. Cyclists were also more visible to motorists. In the 1980s, the first LED taillights appeared. These red “blinkies” were much more energy efficient than even halogen bulbs, allowing small batteries to last a full season. Their rapid blinking soon became the common signal that a bike was on the road. But bright LEDs were available only in red. In the 2000s, a Nobel-Prize-winning development allowed powerful white LEDs. Since then, white LED efficiency has been soaring year by year, producing ever more light from a given amount of electricity. It’s now possible for a battery powered bike light to shine as bright as a car’s high beam headlight. Even generator lights can now be literally blinding. In the U.S., bike lights are almost totally unregulated, with only a vague minimum standard (“visible at 500 feet”). It’s technically legal to own a light so bright it blinds oncoming motorists, and is even worse for oncoming cyclists on multi-user paths. Germany, however, has long recognized the benefits of proper optical design. By contrast, the German StVZO standard specifies minimum light levels at different positions within a headlight beam, and a maximum brightness above the “cutoff” to prevent blinding others. The world’s best road bike headlights are those that meet the StVZO standard, whether the lights are generator or battery powered. The benefits are perhaps greatest for generator lights. The efficiency of modern white LEDs and the efficiency of StVZO headlight beams allow luxurious road illumination when powered by a modern generator. And as LED technology improves even more, this situation will get even better! One final tip: Some overconfident cyclists venture out at night with only flea-sized lights or none at all. On the other hand, some cyclists fear night riding, and compensate with huge arrays of blinding lights and distracting strobes. How to tell what’s really reasonable? Perhaps the best way is to enlist the help of friends! Take your bike to your usual night-riding environment, whether city, suburb or country. Have a friend ride your bike while you observe, first as a pedestrian then by driving past in a car. Be sure to check from various angles and directions. This will tell you whether your lights (and don’t forget reflectors!) are making you sufficiently visible. Then trade the favor with your friend. You'll be glad you did! Thanks to Peter White for the photo of the bottom-bracket generator.